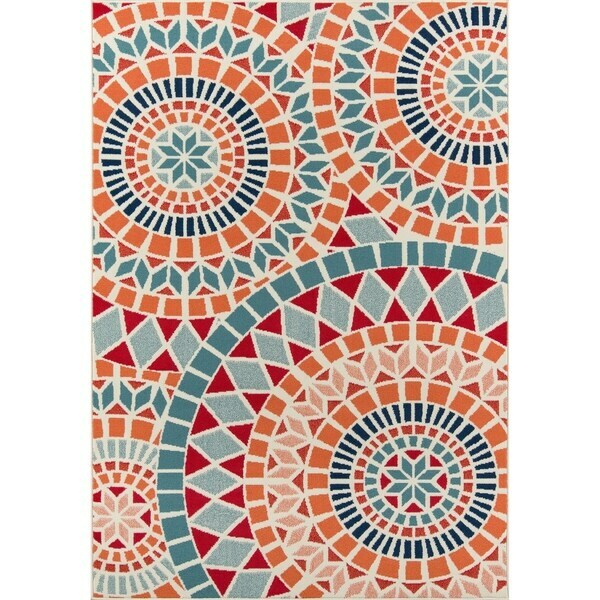 Modernize the colorful aesthetic of your terrace decor with this rug's vibrant design and geometric pattern. The rug's durable power-loomed construction ensures an all-season appeal and provides a sturdy pile that easily manages heavy levels of foot traffic. Dimensions 43.0 In. X 20.0 In. X 0.5 In. "Does this rug meet the California fire code? Could it be used in a school and comply with fire code?" This rug does not meet CA fire code and is not designed for commercial use. "Will this rug endure with rain etc. on outside deck without cover?" Yes, this rug will endure with rain etc. without the cover.